DSTRYRsg: Destroyer Submission Grappling and Brazilian Jiu Jitsu: CAIN VELASQUEZ HAS A BROWN BELT. YOU SERIOUSLY DO NOT WANT TO F#^K WITH THIS MEXICAN! 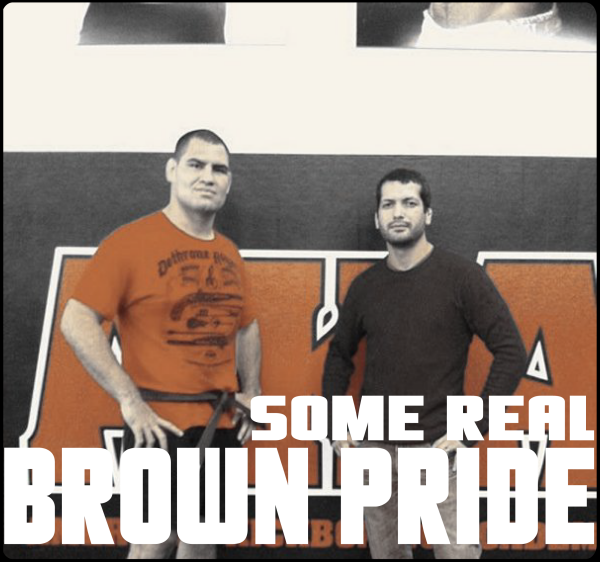 CAIN VELASQUEZ HAS A BROWN BELT. YOU SERIOUSLY DO NOT WANT TO F#^K WITH THIS MEXICAN! A couple days ago, Dave Camarillo awarded Cain Velasquez his brown belt in his Guerilla Jiu Jitsu system ("GJJ"). I don't know too much about how GJJ differs from BJJ (except that it incorporates a lot of Judo), but given Dave's credentials and reputation, I'm sure it's totally badass and legit. This is yet another indicator to us all that challenging Cain to any kind of mortal combat is most likely unwise. I'd only do a it on a double dare or if promised food or maybe a latte or other coffee beverage. In doing the bare minimum of research on the subject in order to maintain the level of accuracy you've grown to expect from us, we came upon the some unnecessary forum arguing about whether or not Cain is a real brown belt and how GJJ stacks up against real BJJ. If you have nothing else to do, enjoy that here. He is definitely grade A badass. He is american though like you said born and raised here. Rock on USA!! !